Evaluating Paul Ryan’s budget plan on its own terms. The new GOP budget unveiled by Paul Ryan is a wildly cruel document. Yet pointing this out, as Democrats keep doing, seems only to flatter Ryan’s self-conception as a serious man telling hard truths. So let me instead concede Ryan’s moral premises. (Throw tens of millions of people off health care? Why not! Slash food stamps? It’ll just inspire the next Dickens!) Instead, let’s judge Ryan by his own standards. Does his plan, however cruel, actually address our fiscal realities? No, it doesn’t. If you want to reduce the deficit, you have to come up with some combination of ways that people will pay more taxes to the government or get fewer services. That’s hard for politicians. Declaring a general intention to make unnamed people pay more, or unnamed programs do less, is easy. Ryan’s plan does single out a lot of people who would get less from the government. Specifically: the poor and the currently uninsured. Ryan would eliminate all the new coverage in the Affordable Care Act, increasing the ranks of the uninsured by some 30 million. That’s good! (Remember, we’re inhabiting Ryan’s moral universe. If those leeches wanted health insurance, then they should have thought of that before they decided to get breast cancer.) On top of that, he cuts another huge chunk from Medicaid, almost as much from food stamps and other aid to the impoverished, and there we go: about $3 trillion in honest-to-goodness budget savings wrested from the claws of the sick and poor. But then, alas, Ryan gives all those savings right back and then some by proposing to permanently extend the Bush tax cuts, at a cost of almost $4 trillion. Ryan’s explanation for this decision in this report, which begins by decrying the existential dangers of the national debt in the most lurid terms, is comic. He explains that raising taxes on the rich would not, by itself, solve the problem. “To close the ﬁscal gap by raising the top rates,” he writes, “the government would have to collect an additional $500,000 each year on average from every taxpayer in the top two brackets.” So, he reasons, let’s just give them a big tax cut instead. Likewise, you don’t have enough time in the day to lose 20 pounds through exercise alone, so you might as well quit the gym and start watching more television. So now Ryan has given back at least as much as he’s saved. Then, on top of those tax cuts, Ryan proposes to slash the corporate tax rate and the top income tax rate by ten points each, diverting hundreds of billions of dollars out of the revenue stream. He does promise to make up for this lost revenue by closing unspecified tax deductions. But note the asymmetry of his promises. The goodies (low, low tax rates) are specified. The mean stuff (fewer deductions) isn’t. Meanwhile, Ryan does claim to save $1.6 trillion over the next decade by slashing all the other functions of government except defense and homeland security by a third, not even accounting for population growth. “All the other functions” means the FBI, highways, environmental protection, the Coast Guard, and so on. Ryan may think this vast category is stuffed with useless or over-funded programs, but, if he has any specific beliefs to this effect, he is keeping them to himself. Conveniently, this allows Republicans to plausibly deny that any particular program will lose funding. This also makes it far less likely that these cuts will actually occur. Then you have Ryan’s proposals that would, according to bipartisan experts, make Medicare more wasteful. The Affordable Care Act establishes an Independent Payment Advisory Board to root out unnecessary or over-priced treatments (often pushed by powerful medical lobbies) from Medicare. It also ratchets down the tax deduction for very costly employer insurance. Ryan, seemingly motivated by perverse spite, would ditch both reforms. To be fair, he does have alternative ways to improve efficiency. Ryan would convert Medicare into a voucher system starting in 2022 for new enrollees. He argues that forcing people to pay for their own health care would make them wise shoppers and bring down cost inflation. Remember, for the purposes of this column, we don’t care if Medicare gets less bang for the buck as long as it spends fewer bucks. But, practically speaking, this part of Ryan’s plan stands little chance of actually saving money, either. It purports to save huge sums by shrinking the value of Medicare vouchers over time, eventually to tiny sums that would cover a fraction of the cost of health care. The more the vouchers fall short of covering the full cost of care for the elderly, though, the harder it is to believe that Congress will sit still. And Ryan’s Medicare privatization would make that worse. Right now, any politician trying to keep Medicare costs down has to contend with angry old people. Under Ryan’s plan, they’d have the angry old people plus the powerful insurance lobby, which would have a strong interest in keeping the vouchers to buy its product as generous as can be. During the health care debate, Republicans—including Ryan— adopted a stance of extreme skepticism toward President Obama’s Medicare cuts. 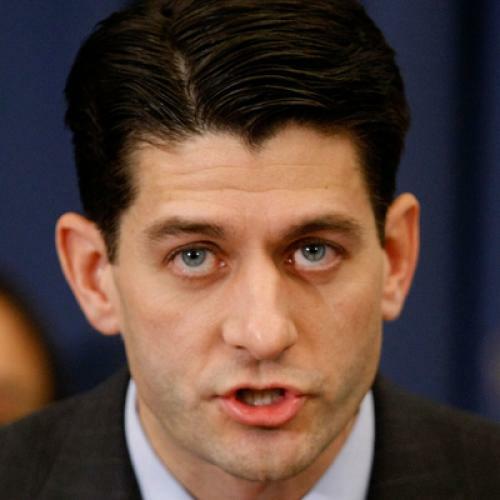 “I question the stomach of Congress in sticking with these painful decisions,” Ryan asserted. Republicans expressed this skepticism even of cuts that the health care industry had accepted in return for millions of new paying customers—that is, the previously uninsured. Now Republicans are insisting that, about ten years from now, newly minted retirees will happily give up traditional Medicare for insurance vouchers that are not guaranteed to cover their health care. And then Congress will stand by— for decades!—as those vouchers cover less and less of the elderly’s medical costs. The more likely outcome, of course, would be that Ryan’s waste-promoting measures get preserved and his care-denying measures get overturned. “This isn’t a budget,” boasts Ryan, “This is a cause.” Yes, that’s the problem. Jonathan Chait is a senior editor at The New Republic. This article originally ran in the April 28, 2011, issue of the magazine.